I started my first quilt in March of 2013. It has been two months shy of four years since those first stitches. 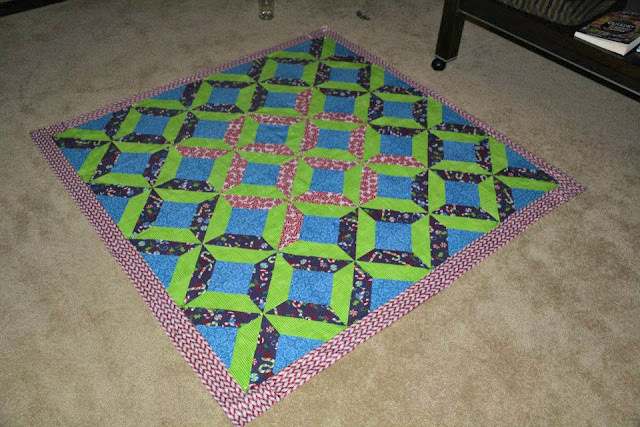 As I am writing this post, I am working on my 73rd quilt. With each quilt, I learn something new. Sometimes it's a game changer, like when I learned how to trim up fabric and cut in strips. (How did I make those first five quilts?!) Sometimes it's a subtle confidence in improving my craft. Even when I struggle, I usually find a way to finish the quilt, muttering the mantra, "Finished is better than perfect." My last finish of 2016 is actually the 15th quilt I started back in December of 2013. And it wasn't meant to be a quilt. It was intended to be a tree skirt! My favorite color is purple, so when I found purple Christmas fabric at Joann, I bought a yard, naively thinking that would be enough for my project. I didn't finish it before Christmas so I set it aside for a few months to work on other things. When I pulled it out again, I was feeling pretty good until I ran out of the purple print. Look how little my now 8-year-old is! The BIG lesson I learned: fabric goes out of print! This is why quilters have big fabric stashes! We buy multiple yards of fabric at a time to avoid these problems! I checked ebay, Etsy, and all the fabric de-stash sites, but I couldn't find any more of the purple print. D thought I could make a quilt for Curious George. Then I found some peppermint fabric and tried to make it work, but I didn't like how it turned out. So I shoved it in a closet for a few years. As Christmas got closer this year, I thought about it again and decided I could make a small quilt with it to be done with it. I ripped it all apart down to blocks and re-assembled it into this. It was still pretty small, but nothing that a few borders couldn't fix. Fortunately, I still have plenty of the blue and green prints. For the back, I found this minky at Joann and thought it was perfect. I finished the quilt the day before we left to celebrate Christmas in Arizona with me mom. 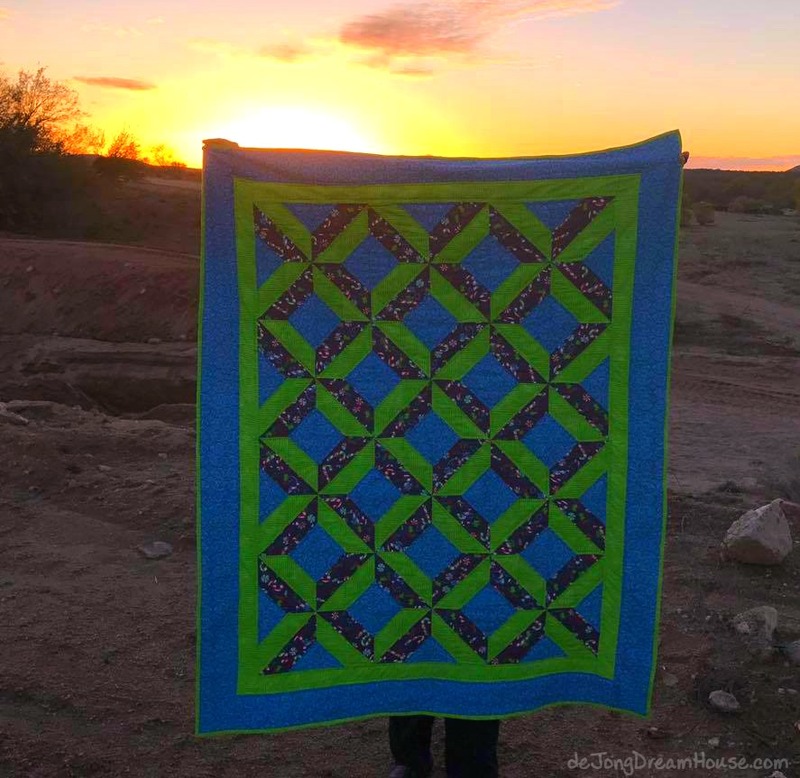 I was feeling a little frustrated as I quilted because of little annoyances like running out of thread, and my own general crankiness with it not being what I had originally wanted it to be. I had already decided to keep it, but I needed some happy memories with it, so we took it on a road trip. It was fun looking for the right photo opportunity. 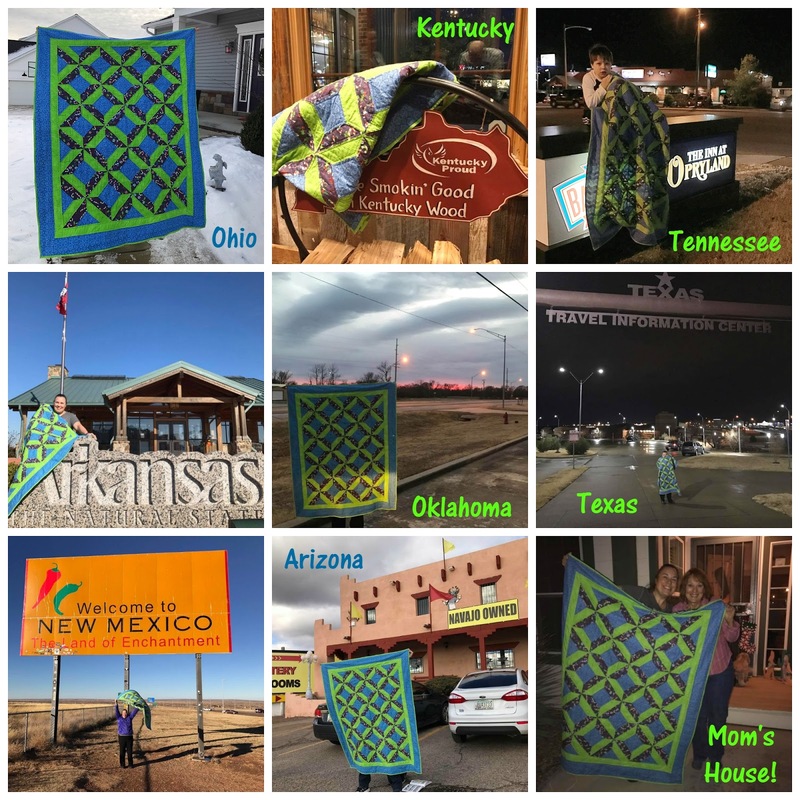 1: Home in Ohio 2: A potty stop at a BBQ restaurant that smellled SO good in Kentucky 3: Our hotel in Nashville, Tennessee 4: A lodge-like welcome center in Arkansas, 5: Sunset somewhere in Oklahoma 6. Midnight in Texas 7. A windy welcome to New Mexico 8: A Navajo shop in Arizona where we talked with a woman about the code talkers 9: Mom's house! It was a fun way to break up a very long road trip. 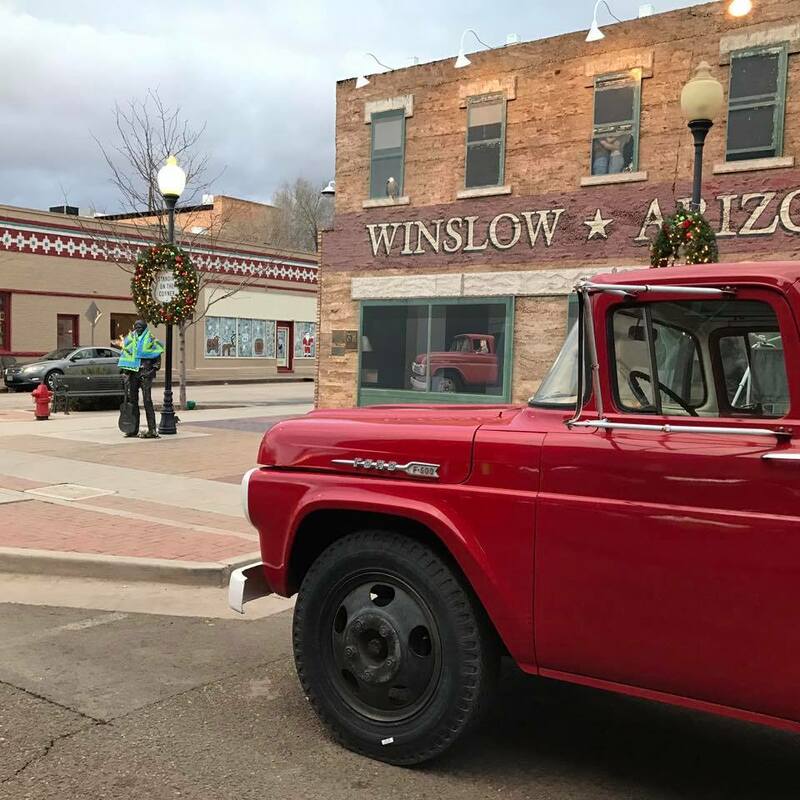 Some of my favorite pictures were taken in Winslow, Arizona. But my very favorite picture was this one with mom's new puppy. 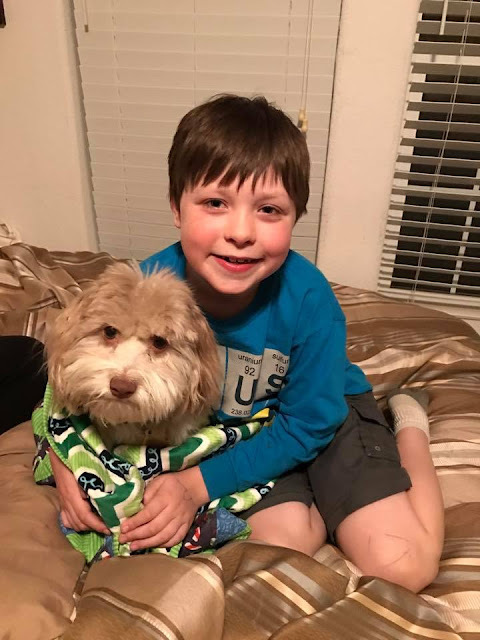 Our son has been severely allergic to dogs all his life. We started him on desensitization therapy a few months ago and this trip would be our big test. We are all so thrilled that it has been a huge success! The purpose of our trip was to celebrate one last Christmas at my mom's house and help her pack up 70 years of memories. The fact that D and Murphy became such good friends is a really nice bonus. We are about to head back home today and the quilt is filled with happy memories and Murphy cuddles. 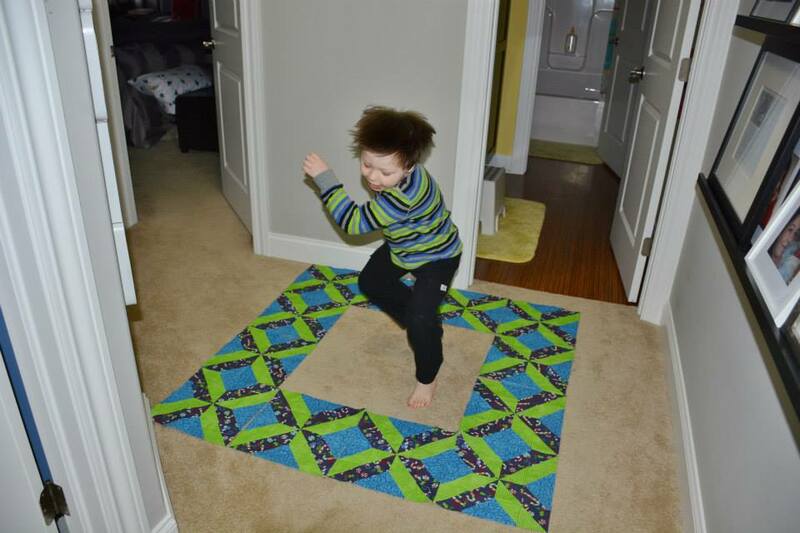 Great quilt with a great story! And fantastic pictures too, thanks for sharing!! Ooh, I hope this means that within the next couple of years you will be able to adopt a puppy again. Yes, fabric going out of print is the bane of a quilter's existence!! I just have to guard against running out, by buying several yards of everything, LOL!! Funny thing about that. After our big trip, I did bring the quilt back with me. But now, whenever Mom is here with us, the quilt magically appears in her room!